This is London’s most comprehensive list of soup kitchens, soup runs, community fridges and foodbanks without referral – 394 places to be exact! You only find out about most of them by word of mouth, which involves a lot of asking around and takes a long time. Soon this website will be available as a free phone app you can download here. You’ll be able to search offline for homeless services in London that are open later, view interactive maps, save your favourite ones as a timetable and set alerts. I’m ex-homeless. Others have attempted to write lists of soup kitchens but missed out most of them because they’ve never set foot in them, so have no idea where they are. I first wrote a list of all the homeless services in North and East London in 1995. There were no lists of homeless services available to homeless and ex-homeless, so it was very popular. I didn’t have a typewriter, let alone a computer so it was handwritten on A4 paper and designed to be folded so it fitted in your pocket. I photocopied it and distributed it to homeless and ex-homeless people at a soup kitchen in Islington. I still don’t have a computer or internet, so have entirely written this website of homeless services on a computer at the library and the free wifi at stations, on a free WordPress website on a £0 budget. Thanks to Mark, Richard, Dave, Peter, Ale, Moe, Mark, Paul, Pat, Jay, John, Dave, Luke and Rachel for contributing to this list of soup kitchens and soup runs. This list of soup kitchens and soup runs is a work in progress. I can’t guarantee the information is accurate because I don’t have credit to ring the soup kitchens to check it’s right. I can’t remember the last time I had credit on my phone! If you’ve spotted any errors, please let me know so I can correct them – if any have closed down or changed their opening times, or if any of the web links no longer work. Can you be more specific about what food is on the menu? Anything else we need to know about, like if a day centre asks for your details, or wants to assess you before they’ll let you through the door, or they make you sit through a sermon before you can eat? Do you know any other places where you can get a free meal? Please leave a message in the comments section below with the soup kitchen or soup run’s name, address, opening times and what kind of food they offer. 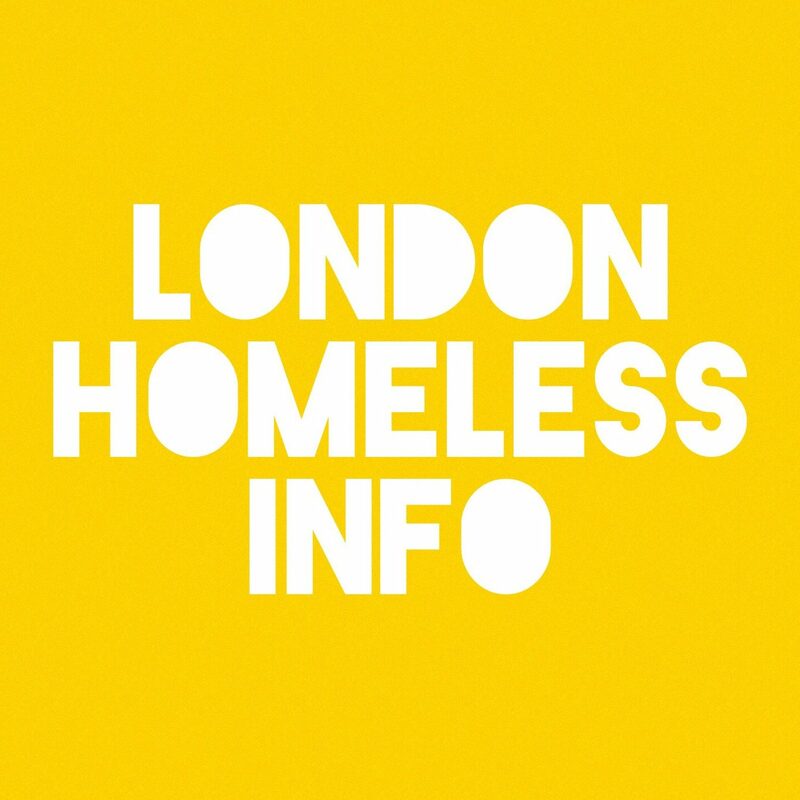 This list of homeless services and its content is copyright of London Homeless Info. Any reproduction of part or all of the contents in any form is prohibited. Camden Town station, 176-178 Camden High St, London NW1 8NH map Wed, Fri & Sun 7:30pm inedible hot food, boiled eggs, cold pizzas and Greggs sausage rolls and hot drinks outdoors. Nowhere to sit to eat. Mon, Wed & Fri 2-3pm, Sat & Sun 3-4pm hot meal. Clothes & showers on Sun. Sikh temple offering a free vegetarian meal in the Langar Hall on the carpet to all visitors during opening times, without distinction of religion, ethnicity or economic status. Remove your shoes & cover your head. Community fridge with surplus fresh food for cooking Opening times??? Harlesden Ummah, 21 Craven Park Rd, Harlesden, London NW10 8SE map Sat 12:30 -1:30pm 3 course meal. Closed for Ramadan in June. Tues–Sat 12:30–1:30pm sandwiches & hot drinks outdoors at the door. Sun 3-5pm in basement. Wed 1–2:30pm three course vegetarian meal, two food items e.g. cereal, fruit or veg to take away & more at the end. No hot drinks. Food parcels. Waiting for details of when. Thurs 1-4pm hot drinks & foodbank without referral. 7 food items. Fri 1-4pm foodbank without referral. 5 food items – veg, fruit, yogurts, pasta, rice and tins. Take a bag. 3rd Sun of month 6pm-7:30pm soup, Caribbean meal – chicken/fish/veg stew, rice, sweet potato, salad & cake & icecream. Opens at 5:30pm for 30 min biblebashing sermon, and by 6pm there are no chairs left for meal. So you’re faced with going when they open and tuning out your ears to the biblebashing or having nowhere to sit. They want your full name which they tick on a spreadsheet divided into weeks. When asked why they needed my full name, they stated it’s to keep track of how many people they have to cater far. More like to keep track of how many weeks they’ve been brainwashing you. Thurs 6–8pm in winter, 7–9pm in summer. Dinner & hot drinks. No vegetarian option. Sat 1:30-2:30pm vegetarian hot lunch & cakes. Sun 12:30-1:30pm soup. No hot drinks. Mon–Sun 8:30–9:30am. Mon-Sat porridge. Sun cooked breakfast. Eat sandwiches and salads to take away. Thurs 11:30–12:15pm hot lunch, sometimes cakes. Tea, Chinese tea and Chinese meal. Take tupperware for food to take away. Mon–Thurs 7:45–8:30pm, Sun 5-6pm soup, usually inedible hot meal & cakes. Donated food from supermarket to take away. For 6 weeks in summer Thurs & Sun only. Mon 12–1:30pm & Wed 7–8:30pm vegetarian three course meal – soup, hot meal, pudding & hot drinks. Take tupperware for food to take away. Bread and sometimes veg and fruit to take away. Shower. Some Fri 6-7pm – 22 Jan. 4:30-6pm if you want to help cook the meal. Fri 1-3pm??? Be punctual for 1pm. Large bowl of soup & sandwiches, sometimes sandwiches & cakes to take away. Wed 5:30-7pm soup. Food bags to take away. Mon, Tues, Wed & Fri 9am-3pm, Thurs 9am-2pm. Don’t know if every Sun??? Mon 10am-12pm breakfast. Closed for Ramadan in June. Thurs 11am -1pm fresh, tinned and packet food for older people. Take a bag. Drop-in Mon-Sun 24 hours. Don’t know if food is free. Mon-Thurs 10:30am-12pm & 8-9:30pm. Fri 10:30am-12pm. Sat 12:30-2pm, Sun 6:30-8pm. Hot meal, hot drinks & soft drinks. Shower, toiletries and some clothes. Thurs & Fri 3:30-4:30 pm community fridge with surplus food for cooking. To sign up, fill in form. Mon, Tues, Thurs, Fri & Sat 10am–12pm hot food. Closed in Aug. Hot food in covered area. They don’t allow you to use the toilets. It’s actually illegal for a place serving food not to have toilets. Tues & Thurs 6–8:30pm hot meal. Registration first, allowed in from 7pm. Film & dinner on first Sun of the month except in Jan (13 Jan). Doors open at 5pm. Film starts at 6pm. No entry after 6:15pm. Wed 4:30–8pm soup, sandwiches & drinks 10p each. Free sandwiches from 7pm. Previously at St Peter’s Vere St. Some Saturdays on random dates 6:15-9pm, see website. Next on 18 May 2019. Hot meal & pudding. The first time you go to a CLSRC meal you need to get a membership card with a number which you need every time. Previously at St Mary’s Wydham Place. Sat once a month 6:15-9pm, see website for dates. Next on 11 May 2019. Hot meal & pudding. The first time you go to a CLSRC meal you need to get a membership card with a number which you need every time. Sat once a month 6:15-9pm, see website for dates. Next on 22 June 2019. The first time you go to a CLSRC meal you need to get a membership card with a number which you need every time. Hare Krishna Food for All food cart outdoors with black parasol on Portsmouth St, London WC2A 2ES, off Lincoln’s Inn Fields map Mon-Fri 12-2pm curry and rice. Outdoors on Lincoln’s Inn Fields / Newman’s Rd corner map Mon–Thurs 6:30pm Lincoln’s Inn Fields / Portsmouth St WC2A 3LJ corner by LSE picnic tables map Fri & Sat 6:30pm. Curry, rice, cake & homemade juice. Women go first for some handouts. Not suitable if you have mobility problems as you have to queue and stand around for ages. You can sit down to eat on LSE picnic tables or in the park. Outside Ryman’s, 430 Strand, London WC2R 0QN map Fri 8:45–11pm. Waterloo, near IMAX map Fri 9:15–10:30pm. Chilli con carne & great coffee. Wed 7pm Pink gazebo. Hot food, sandwiches, cakes, fruit, hot drinks, toiletries and clothes. Sat 5:30–7:45am tea run: Back of Transport Museum, Tavistock St, Covent Garden, London WC2E 7BB map 5:30–6:15am. Savoy Place, Embankment, London WC2R 0BL map 6:15–6:45am. William IV St, near Strand, London WC2N 4DW map 6:45–7:30am. All Souls Church, Langham Place, near Regent St, London W1B 3DA map 7:40–7:45am. 6-8 Webber St, Waterloo, London SE1 8QA map Sat 9am–12pm breakfast, get ticket on Mon. Sun 8:30-9:30am instant porridge, half a egg mayo or bacon roll, fruit & hot drinks outdoors. We all left hungry and some without eating at all as never have enough vegetarian rolls. Coming soon in Central London. Locations to be announced. Mon, Tues, Wed & Thurs: Arundel St, Temple map 7:15am. Agar St, Strand map 7:30am. Henrietta St, Covent Garden map 8am. Sandwiches, pastries & hot drinks. For people in recovery or still struggling with drink or drugs. Sat & Sun 2-5pm toasted sandwiches, Pret salads and sandwiches in fridge and hot drinks. Foodbank in another room – meat, veg for cooking and fruit. Mon-Fri 10am-8pm. Sat and Sun 11am-6pm. For those who live in the area, affected by Grenfell fire. For people in recovery or still struggling with drink or drugs. Mon & Tues 10am-12pm. Thursday 1:30-2:30pm. Fri 10:30am-1pm. Sat 12-4pm cooked breakfast, hot drinks and food to take away. Sun 12-4pm wrap, hot drinks and food to take away. Mon, Tues & Wed 2-5pm. Fri 2:30-5pm. When it’s been under 0° the previous night they open at 10:30am. Free soup, fruit and sometimes yoghurts. Hot meal only free from 4pm, before then £2.50. Showers. Laundry £1.30, free if no benefits or income. Sun one week and Mon the next. Tues, Wed, Thurs & Fri 11:45am-2pm. Hot meal. Bath Rd / Welstead Way, London W6 0XW map??? Vegetarian meal served in the Langar Hall on the carpet. Remove your shoes & cover your head. Sun 8–9am cooked breakfast. Last Sat of month 2–3:30pm hot meal. Tues 1-3pm & Wed 10am-12pm toasted sandwiches. Toiletries, clothes, shoes and sleeping bags. Thurs 8-10am & Fri 9-11:30am Thurs cooked breakfast. Fri cooked lunch. Toiletries, clothes, shoes and sleeping bags. Mon-Sun 6-11am. Women only Fri 12-3pm. Mon-Sun 8-10am full English breakfast and choice of cereals. Not free, 50p. Also at Victoria and Barking where??? when??? Lola’s Homeless 07950 355241 Wed what time??? One Third Sat what time??? Wed & Fri 10am-3pm rough sleepers. Breakfast 9-10am. Mon–Fri 8am–12pm. Lunch Mon–Fri 12-2pm. Free soup, sandwiches, salads & pudding. Main course 40p, side dish potatos or veg 15p. Outdoors on Bridge Place, Victoria, London SW1V 1AF map Wed 7:30-8:30pm. Then they walk around Victoria from 8:30pm. Ebury Lodge, Ebury Bridge Estate, Ebury Bridge Rd, Victoria, London SW1W 8QZ map Fri 1pm foodbank without referral. Veg, fruit & sometimes frozen food. Sun 5:30-7pm Vegetarian rice & curry or noodles and fruit. Hot drinks – tea, coffee, hot chocolate, green tea and soup. Feeding Folk 1st Sun of the month. Mon-Thurs & Sat 9am-12pm. Breakfast 9:30-10am. Coerce you to listen to preaching to get breakfast. Door open 9-9:20am, then close door until 9:45. Preaching from 9:30-9:45am. If you go in when the preaching is over, most of the food is gone. Tues from 10:45am hot drinks & homemade cake. Lunch 12:45-1:30pm hot meal. Mon 9am-2pm, Tues 8am-2pm & Thurs 9am-2pm. Hot meal 1pm. Hot drinks only free 10am-11am. Wed & Fri 9am-2pm Scrambled eggs, boiled eggs, baked beans, sausage, porridge, brown or white toast, peanut butter, honey, chocolate spread, jam, apple or orange juice & hot drinks. Closed for 4 weeks in July-early Aug. Previously at St Augustine’s South Kensington. Fri 6:30-8:30pm hot meal and fruit. Next on Sun 8 Oct 2018 12-5pm, then moving to new building, no location yet. Hot meal, bike repair and build your own bike from parts for free. ​Fri 6-8pm Food parcels. Contact first to register. Café offering free meal Thurs 12:30pm until you’ve finished your meal. Soup, hot meal and pudding. Winter only Mon, Tues & Thurs 9am-4pm what food??? Tues & Thurs 10:30am-2pm. Wed 10am-12pm rough sleepers. Mon & Fri 11am-1:30pm women only. Cereal and egg for breakfast, hot lunch and hot drinks. For migrants, asylum seekers and refugees. School term times only. Mon & Wed 9am–3:30pm, Tues & Thurs 9am–2pm. Soup & hot drinks. Lunch not free. Wed 7-9pm soup, hot meal & pudding. Closed in Aug. Sat 1:30-3pm drop-in for ex-service men. Hot meal. Tues 6-9pm hot meal. No hot drinks.